Cape Charles Lighthouse – Chesapeake Chapter U.S.L.H.S. The first lighthouse at this site was completed in 1828. It was a 60 foot masonry tower that was painted white. In 1856 $35,000 was appropriated for a new tower. Work started in 1860 and at the start of the Civil War was only 83 feet tall. The Confederates raided the site and destroyed the light and took anything of value from the construction site. In 1864 and additional $20,000 was authorized and the tower was completed and lit in 1864. Erosion was active in the area and after a storm in 1889 the tower was condemned. A new cast iron skeleton tower was built and first lit on August 15, 1895. This is the current standing lighthouse that you see. 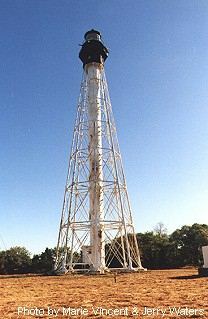 The 1st order Fresnel lens was removed in 1963 when the station was automated and is now in an excellent display at the Newport News Mariners’ Museum. This story is based on an article in the Norfolk Virginian-Pilot of July 14, 2000. A brush fire on July 13, 2000, has destroyed the 1895 keeper’s quarters at Cape Charles Light on Smith Island, Virginia. The origin of the fire is not known. About 30 acres of dry grass and upper marshland were burned, including the light station. Several dozen firefighters from Northampton County volunteer fire departments finally extinguished the blaze. Reports indicate there was only minor damage to the lighthouse, the nation’s second tallest. The lighthouse is a cast iron skeletal tower likely to resist all but the most intense fires. Other light station buildings include a brick generator house, brick coal shed, wood storehouse, and wood privy. The fate of these buildings was not reported immediately. Directions: The Cape Charles Lighthouse is one of those lights that you can’t get to by car. It is on Smith Island just north of the entrance of the Chesapeake Bay. The island is owned by the Nature Conservancy. It can be seen from Fisherman Island on the Chesapeake Bay-Bridge Tunnel, although there is no place to stop. There is a parking area for the wild life refuge right after you get off the bridge on the right side going north that does offer a view of the lighthouse but you are still over three miles away.